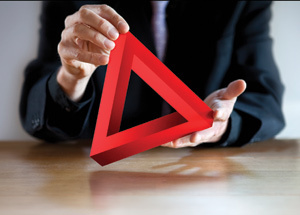 Fraud examiners have used the fraud triangle as a standard method since the 1950s to understand fraudsters' motivations. However, the triangle is inadequate for deterring, preventing and detecting fraud because pressure and rationalization cannot be observed and do not adequately explain every occurrence of fraud. Here are some tools that go further. Adapted from "Beyond the Fraud Triangle," published in the July 2010 issue of The CPA Journal, copyright 2010, with permission from the New York State Society of Certified Public Accountants (NYSSCPA). In 1978, Walmart hired Thomas Coughlin as director of loss prevention. Over the years, Coughlin worked his way up in the organization to become vice chairman, one of the most powerful positions in the organization. But in March 2005, Walmart's board of directors forced Coughlin to resign amid allegations of fraud and deceit. In an April 8, 2005, article in The Wall Street Journal, reporters James Bandler and Ann Zimmerman wrote that "Mr. Coughlin periodically had subordinates create fake invoices to get Walmart to pay for his personal expenses. The questionable activity appears to involve dozens of transactions over more than five years, including hunting vacations, a $1,359 pair of alligator boots custom made for Mr. Coughlin and a $2,590 dog pen for Mr. Coughlin's Arkansas home." According to the article, the total estimate for questionable transactions was between $100,000 and $500,000. In January 2006, Coughlin pleaded guilty to felony wire fraud and tax evasion charges for embezzling cash, gift cards and merchandise from Walmart. What makes the Coughlin tale so interesting is that The Wall Street Journal reported that in the year immediately prior to his "resignation," Coughlin's compensation totaled more than $6 million. Risking a $6 million compensation package, as well as the shame and related consequences, for a few hundred thousand dollars over a five-year period seems irrational. Coughlin's behavior also is inconsistent with the fraud triangle model, developed in the mid-20th century, because the motivation for this fraud did not appear to be caused by a nonsharable financial pressure. The ACFE's "2010 Report to the Nations" estimates the cost of fraud to be 5 percent of businesses' annual revenues. Globally, this translates to approximately $2.9 trillion of economic losses due to fraud. In response, anti-fraud efforts have attracted the attention of a wide group of professionals: internal and external auditors, members of boards of directors and audit committees, management and regulators. To understand why people commit fraud, many anti-fraud professionals refer to the fraud triangle. Its significance in understanding motivation is most evident in Statement on Auditing Standards (SAS) 99, "Consideration of Fraud in a Financial Statement Audit," which makes the concept central. Nevertheless, since the 1950s, professionals and academics have offered important insights that have gone beyond the fraud triangle. These extensions have enhanced professionals' ability to prevent, deter, detect, investigate and remediate fraud. 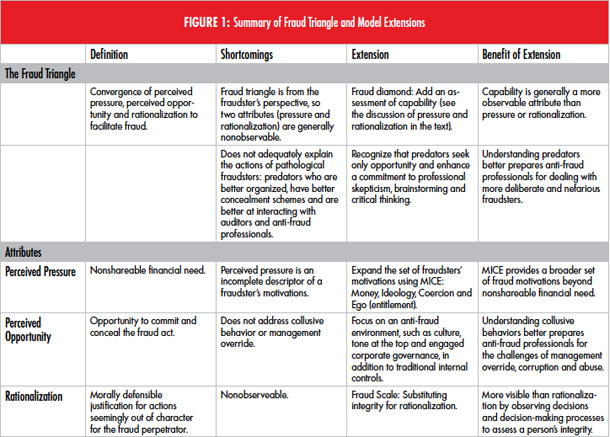 Research beyond the fraud triangle — summarized in Figure 1 below — can help to better understand this societal phenomenon.